3 Godfathers is one of many adaptations of Three Godfathers, which seems to be the quintessential Christmas Western. The premise is relatively simple: three criminals adopt an orphaned child in the desert and attempt to get him to safety. If you're rolling your eyes at the obvious parallels to the wise men, rest assured the characters notice and address this in both this version and the 1913 story it's based on. It's worth noting that the fantastic Tokyo Godfathers was inspired by this, as well. This version seems to be one of the most famous. It's actually the second time John Ford adapted the story for film. In 1919, he made a version named "Marked Men," and even that was a remake of a 1916 version made by Edward LeSaint. Bother the 1916 and 1919 versions starred Harry Carey, who died the year before 3 Godfathers was made. 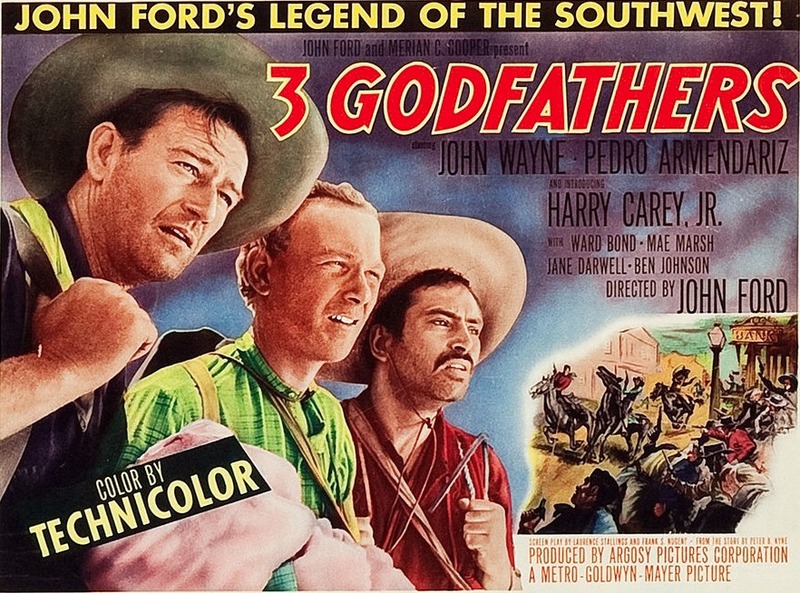 The movie's dedicated to him, and it features his son, Harry Carey, Jr. as the youngest of the godfathers. But the star of the movie is John Wayne, who takes on the lead role. The third godfather is played by Pedro Armendáriz. His character is sometimes stereotyped, which is to be expected from movies of this era, but it's worth noting he was also well rounded and complex. Most of the story seems to be in line with the original and the majority of adaptations. The godfathers rob a bank, but one is wounded fleeing the town. Even worse, they lose most of their water when the sheriff shoots out their water bag. While looking for water, they come across a woman giving birth in the desert. With their help, she's able to deliver the baby but dies soon after naming them the child's godfathers and making them promise to look after the child. While this might sound dark, the mother's death was too absurd to pack a punch. She looked and spoke fine, presumably because the filmmakers didn't want to portray a woman in pain. As a result, it was impossible to take this scene too seriously. After this, the tone continued to lighten as there were a series of sequences involving them trying to figure out how to care for the baby. This didn't last. As their water runs low, they take a Bible verse as a sign and head out across the desert towards a town called New Jerusalem. The first of the godfathers succumbs to thirst and his injury, dying on the way. The next falls while carrying the infant. He manages to protect the child but not himself: he breaks a leg as he falls, and asks John Wayne's character to leave him his pistol. As the last godfather goes on with the child, he hears a single gunshot ring out. The sudden dark turn was impressive. Moreover, they implied it was going to get worse. The sheriff they met in town had tracked them and found the wagon where the woman, who was his niece, had given birth. Misinterpreting the signs, he concluded the godfathers had murdered her and her husband, then destroyed the well. Until then, he'd been presented as a kindly old man, but he took a darker turn, telling his men he'd rather the robbers brought in dead than alive. John Wayne's character was near New Jerusalem, but he's dehydrated and weak. It's unclear whether he begins seeing signs or hallucinating, but he hears the voices of the dead godfathers urging him on. When he's finally about to quit, he finds a mule and donkey, which are able to take him and the baby the rest of the way. The arrive in New Jerusalem late on Christmas Eve, and the saloon takes them in. The sheriff is just minutes behind. He approaches and commands the godfather to turn and draw. Instead, Wayne shows him he's unarmed, cracks a joke, and collapses, unconscious. This is, by rights, the point in the story his character should have been dead. Actually, for the foreshadowing around the sheriff to pay off, he really should have shot the godfather before realizing how wrong he'd been. Instead, there's an obnoxiously lighthearted resolution where the godfather recovers in the town from the beginning and, in light of the care he showed the child, is given an extremely light sentence. The movie ends with him riding off on a train to serve a year in prison, after which he'll return to raise the child and probably marry a minor character who's flirting with him. It's worth noting that this isn't what happened in the original. I skimmed the last few pages, and while the fate of the last godfather seems somewhat ambiguous, it reads to me like he delivers the child then falls over dead. A 1930 adaptation called Hell's Heroes apparently has him sacrificing his life by drinking poisoned water so he'll have the strength to deliver the child to the town. Thematically, that makes far more sense. The Christmas elements are incorporated on several levels, most obviously the connections to the story of the three wise men. But discussion of the upcoming holiday runs through the movie, both in passing conversation and in the occasional joke. There's more than a little symbolism, as well. For example, the wagon the baby's born in is framed to resemble a manger, and the godfathers follow a star. Again, these are both referenced directly by the religious characters, who see God's hand in what's happening. It's not entirely clear whether this should be seen as inspirational, terrifying, or delusional, however. An interesting effect of the altered ending is that it begs the question whether the trek across the desert and the deaths of the other two godfathers were necessary. If the baby was going to end up back at the town the movie opened in, there's no logical reason the godfathers couldn't have turned back and surrendered to the authorities in order to bring the child to safety. It would have had the same effect without as much tragedy. The original ending, where the child is delivered to a new home in New Jerusalem, offers a symbolic rationale that's missing, leaving open some darker interpretations. Does it mean God doesn't exist, and everything that occurred was a combination of coincidence and hallucination? Or perhaps God is not a loving creator, at all: perhaps this quest was undertaken for His petty amusement. You know, I'm starting to come around on this twist ending. But I suspect it was less an existential reflection than a cop-out to give the story a happy ending. Aside from the end and a handful of cheesy sequences, this version is quite good. The leads deliver good work, and the scenery is beautiful. Even with the cop-out, it's still a solid story. I can't quite put this on the list of great holiday films, but it's worth watching if you're a fan of the genre.